Over 100 students, staff, friends, alumni, allies and corporate partners of Middlesex University joined in the Pride parade from Regent Street to Westminster this weekend to raise awareness of LGBT+ (lesbian, gay, bisexual, trans) issues and campaign for equality. The theme this year was ‘Love Happens Here’. This marked the end of a week of activity at the University to celebrate Pride in London. Earlier in the week an exclusive showing of the Oscar winning movie ‘Moonlight’ was held on campus. The screening was followed by a Q&A session with BlackOut UK. Co-editors Marc Thompson and Antoine Rogers challenged thinking around the central themes of the movie - the dynamics of truth, how we all use ‘masks’, and issues around masculinity in different societies. Funds raised went to the Terrence Higgins Trust. David Williams, Director for Corporate Engagement, was delighted to see large numbers of staff, students and alumni getting involved. "To me, Pride is a celebration of acceptance, and self-acceptance, of understanding and love," he said. "Pride is being able to be who you are, and to demonstrate you can love who you want to love with no fear of discrimination, intolerance or judgement. "Prides in 2017 are more important than ever, all the advancements made in recent years such as gay marriage can easily be repealed – they are only paper thin; there is a need for the LGBT+ community to stand together, be strong and be visible. "It is fantastic that Middlesex University have again participated and shown that 'Love Happens Here'." MDXSU officers Rachael Wall and Rohan Kon also took part in a Pride boxing event. Rachael found the experience highly rewarding. “Taking part in the first ever Pride Boxing was an incredible experience and a fantastic way to kick off Pride weekend," she said. 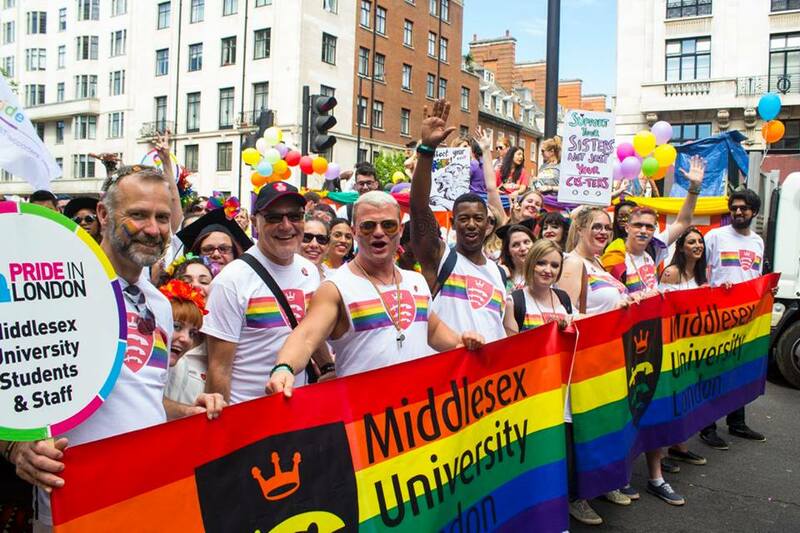 A series of blogs around Pride and LGBT issues were published on the MDXminds blog throughout the week from David Williams, Rohan Kon and Ant Babajee.